These species of bark beetles are native to the forests of western North America from Mexico to central British Columbia. It is one of the most significant of all other conifer/pine bark beetles as they have the ability to destroy large portion of conifer forests. They have a hard black exoskeleton, and measures approximately 5 mm, about the size of a grain of rice. In western North America, the current outbreak of the mountain pine beetle and its microbial associates has destroyed wide areas of lodgepole pine forest, including more than 16 million of the 55 million hectares of forest in British Columbia. The current outbreak in the Rocky Mountain National Park began in 1996 and has caused the destruction of millions of acres of ponderosa and lodgepole pine trees. According to an annual assessment by the state’s forest service, 264,000 acres of trees in Colorado were infested by the mountain pine beetle at the beginning of 2013. This was much smaller than the 1.15 million acres that were affected in 2008 because the beetle has already killed off most of the vulnerable trees (Ward). Attacking ponderosa, whitebark, lodgepole, Scotch, jack pine, and limber pine trees and others. Normally, these insects play an important role in the life of a forest, attacking old or weakened trees, and speeding development of a younger forest. However, unusually hot, dry summers and mild winters throughout the region during the last few years, along with forests filled with mature lodgepole pine, have led to an unprecedented epidemic. It may be the largest forest insect blight ever seen in North America. Climate change has contributed to the size and severity of the outbreak, and the outbreak itself may, with similar infestations, have significant effects on the capability of northern forests to remove greenhouse gas (CO2) from the atmosphere. These beetles develop through four stages: egg, larva, pupa and adult. Except for a few days during the summer when adults emerge from brood trees and fly to attack new host trees, all life stages are spent beneath the bark. In low elevation stands and in warm years, mountain pine beetles require one year to complete a generation. At high elevations, where summers are typically cooler, life cycles may vary from one to two years. Female beetles initiate attacks. As they chew into the inner bark and phloem, pheromones are released, attracting male and female beetles to the same tree. The attacking beetles produce more pheromones, resulting in a mass attack that overcomes the tree’s defenses, and results in attacks on adjacent trees. They affect pine trees by laying eggs under the bark. The beetles also can introduce blue stain fungus into the sapwood that prevents the tree from repelling and killing the attacking beetles with tree pitch flow. The fungus also blocks water and nutrient transport within the tree. 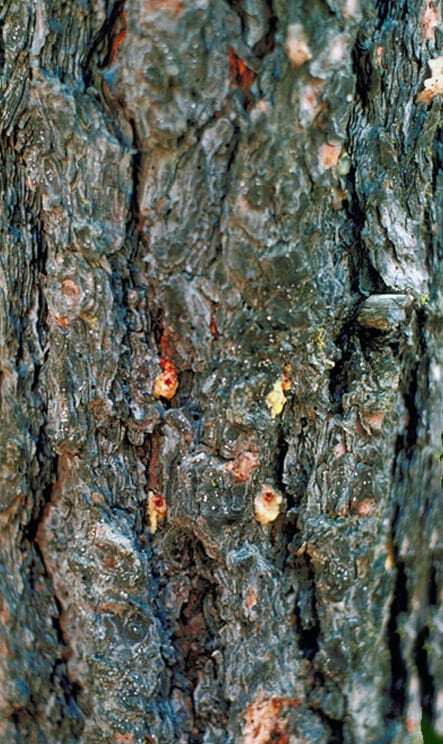 On the tree exterior, this results in popcorn-shaped masses of resin, called “pitch tubes”, where the beetles have entered. The joint action of larval feeding and fungal colonization kills the host tree within a few weeks of successful attack, the fungus and feeding by the larvae girdles the tree, cutting off the flow of water and nutrients. When the tree is first attacked, it remains green. Usually within a year of attack, the needles will have turned red. This means the tree is dying or dead, and the beetles have moved to another tree. In three to four years after the attack, very little foliage is left, so the trees appear grey.